Show someone you care this Valentine's Day with the gift of art. 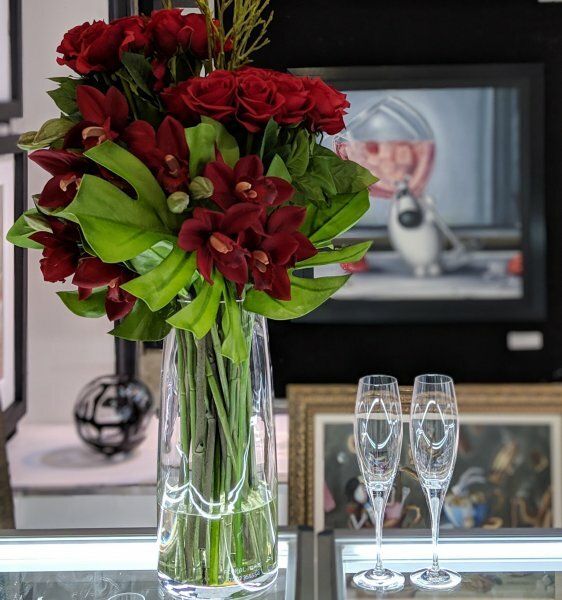 Personal, everlasting, if you're looking for that special art gift for a loved one or treating yourself this year, Westover Gallery have curated a collection just for the occasion. To make your day extra special we're including a complimentary romantic gift on any order over £400! A pair of Kosta Boda crystal champagne flutes completely FREE with select purchases (*T&C apply). Perhaps a romantic scene by artist Jeff Rowland? Why not say you care with a heartfelt Mark Grieves embossed limited edition in charming frame Whatever your style, we have artwork to enjoy any occasion. So enjoy our gift to you and have a very special Valentine's Day! *Terms & Conditions - free champagne flute pair are the Kosta Boda Intermezzo Stemware. Not valid with any other offers or discounts, including £25 registration offer or any Promo code. If discount is applied at checkout please Contact us to request gift item. Offer expires 14th February.